If our Elves were to design a fire truck it would probably look a bit like this. Firstly it wouldn’t be red, because fire trucks are supposed to red and the Elves are idiots. Secondly, anything of value for extinguishing a fire would be thrown away and replaced with something likely to cause one. A jet engine for example. And finally, it would feature styling by a six year old on a lot of sugar. Moritz‘s ‘Afterburner’ drag racing fire truck has thus ticked all our Elves’ boxes, and has caused quite a lot of them to run around the office making ‘NEE-NOR!’ noises. We’re going to get the Mr. Airhorn out of the cupboard to make a noise of our own in a bit, so whilst we do that you can see more of Moritz’s build on Flickr via the handy link above. Hot rod building extraordinaire and TLCB favourite Norton74 is back, with another wonderful recreation of a real-world show rod from decades past. His latest is this stunning Model Team replica of Chuck Miller’s ’67 Ford C-cab ‘Fire Truck’, and it’s gorgeous. Useless at fighting fires, but gorgeous nonetheless. There are more superb images available to view at Norton’s Flickr photostream – click the link above to dial 911. 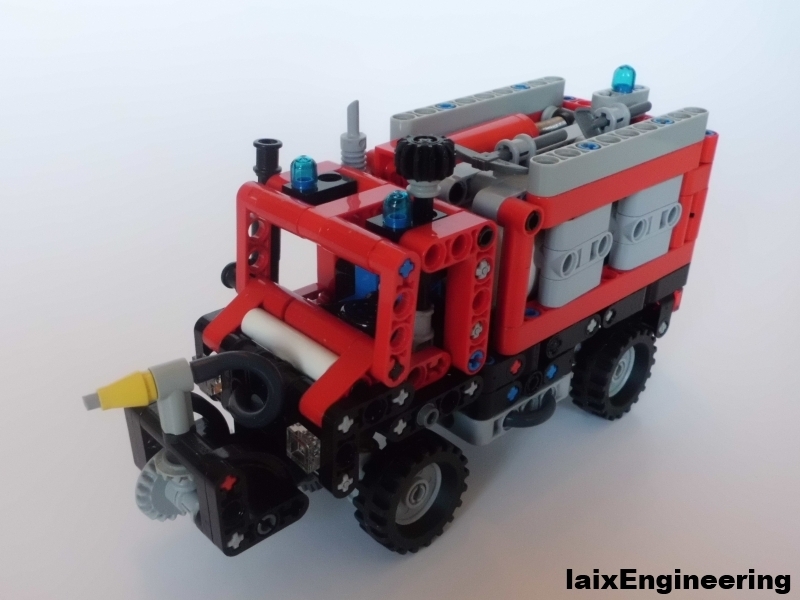 This neat recreation of the world’s most slovenly fire engine comes from previous bloggee sm01. As well as looking rather nice it’s also remote control, and you can see more on both Flickr and MOCpages. Today we have a very special creation to share with you, one that’s had the whole office pouring over it all afternoon. 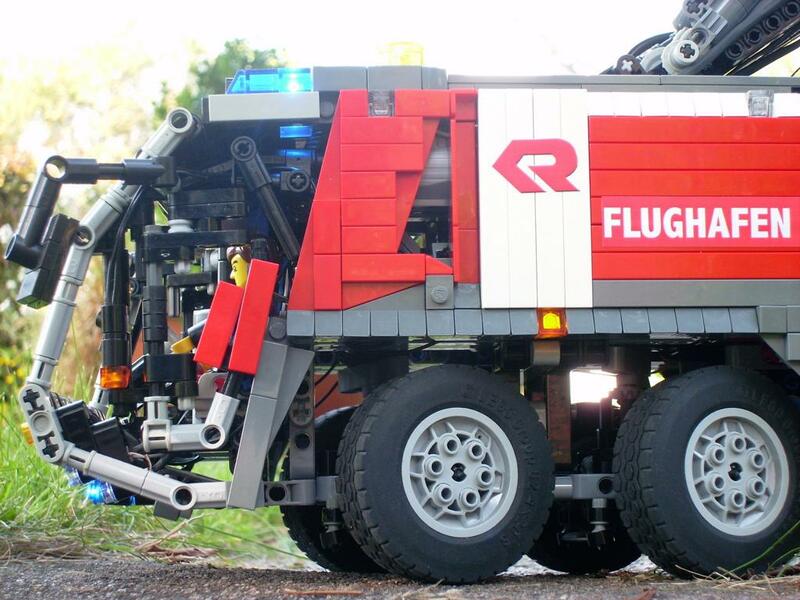 This amazing Technic model is the work of previous bloggee Lucio Switch, and it’s a sight common to all major airports, the essential Airport Crash Tender. Lucio’s creation looks – as you can see from these images – remarkably lifelike, but even more impressive is what this model can do. Hidden inside are fourteen Power Functions motors controlled by five IR receivers and the previously blogged SBrick. These operate everything from the 8-wheel-drive, the 4-wheel-steering, the rotation, lifting and extension of the fire extinguishing arm, the emergency lights, and the direction of second extinguisher nozzle mounted on the front bumper. Oh, and one more function… working water cannons. 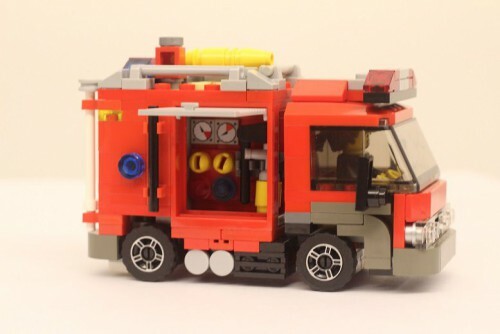 Yes, this Lego model really can pump water and extinguish a small fire! LEGO’s own Pneumatic System is used to pump air into the water tanks, forcing out the water for use when things are getting a bit hot. It’s probably the most amazing Lego vehicle you will see this year – you can see all the images on both MOCpages and Flickr – we can’t recommend making those clicks highly enough! He’s always on the scene, Fireman Sam! And his engine’s bright and clean, Fireman Sam! You cannot ignore, Sam is the hero next door! This beautiful 1980s Dennis fire engine comes from Flickr’s Ricecracker, and he’s used more brilliant building techniques in one model than we’ll sometimes see in a whole week of blogging. Click the link above to see more. It’s red and blue Smarties all round for the Elves at The Lego Car Blog today, as they’ve returned from MOCpages with a pair of little trucks. 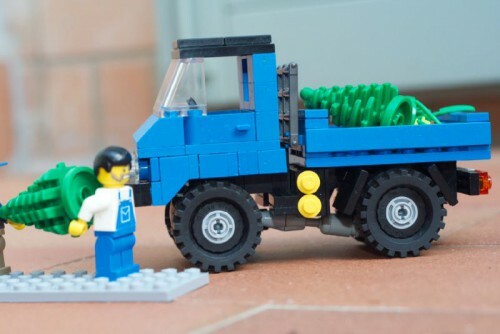 First up is a micro fire engine from Taiwanese builder Chung-Po Cheng, whose bin lorry we featured a couple of days ago. You can click this link to MOCpages to see more of the details that have been squeezed into this truck. Second is Tommaso Garosi’s Unimog. Christmas is coming (there have been decorations in the shops for weeks now) and Tommaso’s crew are busy loading trees onto their truck. Underneath this classic 4×4 are prop-shafts and difs, which you can see by clicking this link to MOCpages. You can compare this with LEGO’s new, official model by clicking this link to our mini 2015 City preview. When the British Army deployed their new invention, known as the ‘tank’, in the First World War the results were slow, unreliable and easily captured. They were also disguised as water carriers, hence the ‘tank’ name which has stuck around until today. Mrutek’s Feuerlöschpanzer Marder has something slightly more in common with its ‘tank’ name than most. See why at Mrutek’s photostream here – it’s worth your click! We know, we know… another Unimog. But this one’s a little different. First of all, it’s, well, little. And secondly, it really can put out a fire. A very small and very localised fire, but a fire nonetheless. Iaix Engineering shows how.